Some readers may not realize that I’m a mom to a teenage daughter. That is a direct results of me not posting openly about her. There are things in my life that are private. And in that regard, I view the majority of her life as being not mine to talk about here. Other than in offhanded ways, I try to respect her privacy. Her stories are her own to tell… or not. There is also the matter that I go off and independently do things that some people might view as questionable for someone who is a mom. Dads don’t seem to get quite as much grief. I have had judgement levied against my parenting by people who read this blog and know exactly ZERO about my “real life.” They’ve said things like “What kind of mother goes off and leaves their kid at home…” And while I rationally know it’s none of their business or that they don’t know the reality of my familial situation – still, it stung. For some people, this seems to be the high watermark of terrible parenting. My motorcycling shows a blatant disrespect for life and for the role of mother. Any positive results of my mom-dom were surely accidental. Well, I don’t know? What if something happened in a 12 car pile-up on my way to work? I do that 5 days a week. From my point of view, the things that we teach our children are in the doing. Will my daughter approach life unafraid? Will she be at ease with following her heart? Will she move through the world unapologetically guilt-free – following her whims? Will she be brave? Will she know that above all else she is her own person and not part of a “pair” of people or someone else’s something? If any of those things are true and if by chance my kind, intelligent, blessing of a daughter learned any of them from me – I think I will have done alright as a mother. I think this either people need to get the stick out of their but and worry about themselves. Sounds as if you have a fine approach to parenting and providing a strong foundation for your daughter to address life. Made me thing of something I just wrote in my own post on mom. I suggested (strongly) to my granddaughter that she not let anyone tell her what to do with her life. My mother lived on her terms and I’ve tried to model that. Your post was really beautiful, Steve. It resonated deeply with me. Your mom sounds like she was a treasure. Seriously?! Girls need more role models who don’t live totally “safe.” Boys are encouraged to take risks, knowing there could be a big payoff/reward. Girls are told to be safe and don’t mess up. Ever. I bought my bike off a guy who had a young child so gave up riding. But, riding makes my heart sing. Staying home with children 24/7 (sometimes them demanding and yelling), not so much. I wish you’d say more about living as one of a “pair.” Women doing things on their own is unconventional, and shouldn’t be. The “pair” thing has been interesting as I’ve begun forging my own identity (I didn’t have one before? It has to be forged?). And my eldest is totally interested in getting his motorcycle license. Heck, yeah. And he’s got a good head on his shoulders. Riding course and gear are assumed. I’ll start with the caveat that, a) I’m a dude and b) not a parent..
As a culture we seem to struggle with risk. We’re sold the notion that we should make life risk free. If there is a less risky way why wouldn’t you take it. We grow and learn best by taking risks. These risk critics only gauge their success by how well they avoid any injury or failure. Unfortunately, if you never fail, you never succeed. You only get to the moon by strapping yourself into a rocket. Success is learning to assess risk and push our boundaries. We fail, we succeed and we find the next boundary to push. Your parenting, what you share of your life with us, shows what a good example you provide. I assume you share your struggles with your daughter. As you grow, so does she. VS the parent that sits back and never takes a risk, never grows. What kind of example is that. Kids are born with a set of genes, nature/nurture, you try and build a foundation for them but there is only so much you can do. Seems like you guys are giving her the best tool, to think for herself. I read this and I think you could not teach your daughter any better lessons. I did not learn these lessons from my mother, I have had to teach them to myself and it is a hard task to unlearn fear and guilt. Good on you for setting boundaries in terms of what you share about your children. As for those who question what you do or how you parent: They obviously have too much time on their hands. I can honestly say that one of the most endearing photos etched in my brain is the time my then 17 year old son rode his own motorcycle in a charity ride with my husband (his father) on his bike and me on my own. Have a great one. Stay sane. Ride well. Travel safe. For me it was my daughter who taught me how to be unafraid. 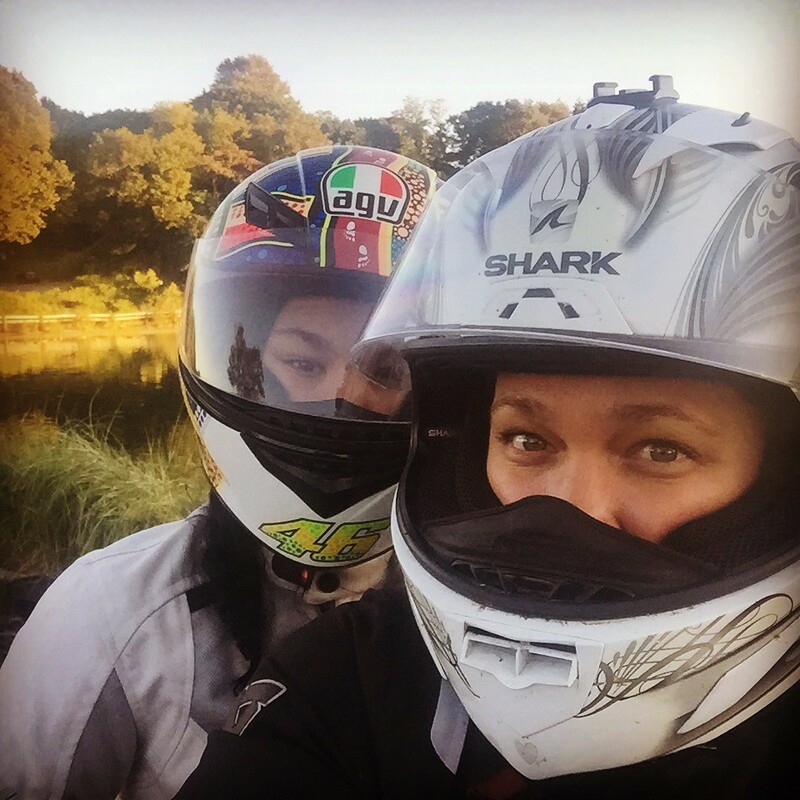 For me, I was a single mom who waited until the kids were out of the house before I started riding again. While raising her, she was the one who went on adventures solo or with friends. She showed what kind of world is out there and be willing to be myself and not what every one expect of me. I hope your daughter will show you what she see through eyes. It’s amazing experience. People love to judge women and criticize them for everything. Especially when the women have responsibilities. But YOU are the best judge of how to meet those responsibilities. Others whose opinions differ can just go … themselves. Yeah, i think people are judgmental about everything. But now everyone has a public platform to voice their displeasure. Maybe that’s the difference. What used to happen in whispers over coffee now gets brought right to your eyeballs electronically at any hour of the day. maybe the upside is knowing where you stand with people? Personally, I love the example you are setting for your daughter, and if she learns even a couple of the lessons you hope for her, she will be more than fine!